Neonatal hypoglycemia, defined as a plasma glucose level of less than 30 mg/dL (1.65 mmol/L) in the first 24 hours of life and less than 45 mg/dL (2.5 mmol/L) thereafter, is the most common metabolic problem in newborns. Major long-term sequelae include neurologic damage resulting in mental retardation, recurrent seizure activity, developmental delay, and personality disorders. Some evidence suggests that severe hypoglycemia may impair cardiovascular function. The image below depicts normal hypoglycemic counterregulation. The detection of adenomas by celiac angiography has had limited success. The chance of detecting a tumor blush must be balanced against the potential risk of causing vascular trauma in infants younger than 2 years. Hypoglycemia should be treated as soon as possible to prevent complications of neurologic damage. Early feeding of the newborn with breast milk or formula is encouraged. The mainstay of therapy for children who are alert with intact airway protection includes orange juice at 20 mL/kg. For patients who cannot protect their airway or are unable to drink, nasogastric, intramuscular, intraosseous, or intravenous (IV) routes can be employed for the following drugs used to raise glucose levels: dextrose, glucagon, diazoxide, and octreotide. Start a 5% or 10% dextrose drip when hypoglycemia is recurrent. Surgical exploration usually is undertaken in severely affected neonates who are unresponsive to glucose and somatostatin therapy. Near-total resection of 85-90% of the pancreas is recommended for presumed congenital hyperinsulinism, which is most commonly associated with an abnormality of beta-cell regulation throughout the pancreas. Risks include the development of diabetes. Hypoglycemia is the most common metabolic problem in neonates. In children, a blood glucose value of less than 40 mg/dL (2.2 mmol/L) represents hypoglycemia. A plasma glucose level of less than 30 mg/dL (1.65 mmol/L) in the first 24 hours of life and less than 45 mg/dL (2.5 mmol/L) thereafter constitutes hypoglycemia in the newborn. Causes of hypoglycemia found in all ages include gram-negative sepsis, endotoxin shock, and ingestions, including of salicylates, alcohol, hypoglycemic agents, or beta-adrenergic blocking agents. Provide genetic counseling for families with affected children, including information about a possible 25% risk of recurrence. Educate pregnant women with diabetes. Normal blood glucose is very narrowly regulated, usually from 80-90 mg/dL (4.4-5 mmol/L). Glucose levels increase transiently after meals to 120-140 mg/dL (6.6-7.7 mmol/L). Feedback systems return the glucose concentration rapidly back to the preprandial level, usually within 2 hours after the last absorption of carbohydrates. 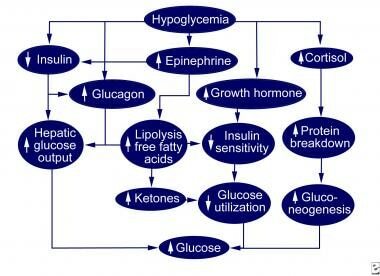 Insulin and glucagon are the important hormones in the immediate feedback control system of glucose. When blood glucose increases after a meal, the rate of insulin secretion increases and stimulates the liver to store glucose as glycogen. When cells (primarily liver and muscle) are saturated with glycogen, additional glucose is stored as fat. In starvation, the liver maintains the glucose level via gluconeogenesis. Gluconeogenesis is the formation of glucose from amino acids and the glycerol portion of fat. Muscle provides a store of glycogen and muscle protein breaks down to amino acids, which are substrates utilized in gluconeogenesis in the liver. Circulating fatty acids are catabolized to ketones, acetoacetate, and B-hydroxybutyrate and can be used as auxiliary fuel by most tissues, including the brain. The hypothalamus stimulates the sympathetic nervous system, and epinephrine is secreted by the adrenals, causing the further release of glucose from the liver. Over a period of hours to days of prolonged hypoglycemia, growth hormone and cortisol are secreted and decrease the rate of glucose utilization by most cells of the body. In the newborn, serum glucose levels decline after birth until age 1-3 hours, then they spontaneously increase. Liver glycogen stores become rapidly depleted within hours of birth, and gluconeogenesis, primarily from alanine, can account for 10% of glucose turnover in the newborn infant by several hours of age. With regard to the last item above, in ketotic hypoglycemia, easily depleted glycogen stores, in combination with inadequate production of glucose through gluconeogenesis, contribute to hypoglycemia. Thus, fatty acid oxygenation is required to provide substrate for gluconeogenesis and ketogenesis. Ketones, the byproduct of fatty acid metabolism, are found in urine and represent the starved state. Poisonings/drugs (eg, ethanol, isoniazid, insulin, propranolol, salicylates, oral hypoglycemics, pentamidine, quinine, disopyramide, unripe ackee fruit, Vacor [rat poison]). Congenital hyperinsulinism is most commonly associated with an abnormality of beta-cell regulation throughout the pancreas. A focal disease, such as isolated islet adenoma, occasionally causes congenital hyperinsulinism. Genetic defects have been delineated and now replace the older terms, such as nesidioblastosis, leucine-sensitive hypoglycemia, PHHI, and islet dysregulation syndrome. These defects are in the sulfonylurea receptor (SUR) and the beta-cell potassium adenosine triphosphate (ATP) channel gene located on the short arm of chromosome 11. Drug-induced hyperinsulinism is secondary to surreptitious insulin administration or the use of oral hypoglycemic drugs. Exogenous administration of insulin is diagnosed with low serum levels of C-peptide. The sulfonylureas are commonly prescribed for adults; thus, they are available to children as unintentional ingestions. In these cases, hypoglycemia may persist for more than 24 hours. Diazoxide administration may be helpful by suppressing insulin secretion in severe cases. The overall incidence of symptomatic hypoglycemia in newborns varies from 1.3-3 per 1000 live births. Incidence varies with the definition, population, method and timing of feeding, and the type of glucose assay. Serum glucose levels are higher than whole blood values. The incidence of hypoglycemia is greater in high-risk neonatal groups (see History). Hypoglycemia is the most common metabolic problem in neonates. Still, the level or duration of hypoglycemia that is harmful to an infant's developing brain is not known. Major long-term sequelae include neurologic damage resulting in mental retardation, recurrent seizure activity, developmental delay, and personality disorders. Some evidence suggests that severe hypoglycemia may impair cardiovascular function. Remission of congenital hyperinsulinism generally does not occur, but the severity of the disease may decrease with time. Ogunyemi D, Friedman P, Betcher K, et al. Obstetrical Correlates and Perinatal Consequences of Neonatal Hypoglycemia in Term Infants. J Matern Fetal Neonatal Med. 2016 Jul 17. 1-16. [Medline]. Yamamoto JM, Kallas-Koeman MM, Butalia S, Lodha AK, Donovan LE. Large-for-Gestational-Age Neonate Predicts a 2.5-Fold Increased Odds of Neonatal Hypoglycemia in Women with Type 1 Diabetes. Diabetes Metab Res Rev. 2016 May 17. [Medline]. Raghuveer TS, Garg U, Graf WD. Inborn errors of metabolism in infancy and early childhood: an update. Am Fam Physician. 2006 Jun 1. 73(11):1981-90. [Medline]. Ishiguro A, Namai Y, Ito YM. Managing "healthy" late preterm infants. Pediatr Int. 2009 Oct. 51(5):720-5. [Medline]. Paudel N, Chakraborty A, Anstice N, et al. Neonatal Hypoglycaemia and Visual Development: A Review. Neonatology. 2017 Mar 3. 112 (1):47-52. [Medline]. Newborn Nursery QI Committee. Portland (ME): The Barbara Bush Children''s Hospital at Maine Medical Center; 2004 Jul. Neonatal hypoglycemia: initial and follow up management. National Guideline Clearinghouse. 2004. [Full Text]. Harris DL, Weston PJ, Harding JE. Incidence of neonatal hypoglycemia in babies identified as at risk. J Pediatr. 2012 Nov. 161(5):787-91. [Medline]. Narchi H, Skinner A, Williams B. Small for gestational age neonates--are we missing some by only using standard population growth standards and does it matter?. J Matern Fetal Neonatal Med. 2010 Jan. 23(1):48-54. [Medline]. Vanhaltren K, Malhotra A. Characteristics of infants at risk of hypoglycaemia secondary to being 'infant of a diabetic mother'. J Pediatr Endocrinol Metab. 2013 May 17. 1-5. [Medline]. Rozance PJ, Hay WW Jr. New approaches to management of neonatal hypoglycemia. Matern Health Neonatol Perinatol. 2016. 2:3. [Medline]. [Full Text]. Joshi T, Oldmeadow C, Attia J, Wynne K. The duration of intrapartum maternal hyperglycaemia predicts neonatal hypoglycaemia in women with pre-existing diabetes. Diabet Med. 2017 Feb 15. [Medline]. Coors SM, Cousin JJ, Hagan JL, Kaiser JR. Prophylactic Dextrose Gel Does Not Prevent Neonatal Hypoglycemia: A Quasi-Experimental Pilot Study. J Pediatr. 2018 Mar 28. [Medline]. Makker K, Alissa R, Dudek C, Travers L, Smotherman C, Hudak ML. Glucose Gel in Infants at Risk for Transitional Neonatal Hypoglycemia. Am J Perinatol. 2018 Mar 26. [Medline]. Harris DL, Weston PJ, Signal M, Chase JG, Harding JE. Dextrose gel for neonatal hypoglycaemia (the Sugar Babies Study): a randomised, double-blind, placebo-controlled trial. Lancet. 2013 Sep 24. [Medline]. Lewis R. Inexpensive Dextrose Gel Corrects Hypoglycemia in Newborns. Sep 24 2013. Available at http://www.medscape.com/viewarticle/811605. Accessed: Oct 2 2013. The authors and editors of Medscape Reference gratefully acknowledge the contributions of previous author Michael Shannon, MD, MPH†,to the development and writing of the source article. Transient Neonatal Hypoglycemia: Not So Benign After All?